The first installment in a planned series, this fun, young adult time-travel adventure mixes music, football, romance, and magic. The perspective is mostly male with glimpses into the lustful mind of the central character, Matt, a macho 6’2”, 210-pound high school football star. The story turns on the power of a magical horn—called a cor anglais— that apparently senses when someone’s destiny is out of sync with the universe and sends the person back in time to fix it. Unwittingly blown back in time by a cor anglais played by schoolmate Iris Jongler-Jinks (who only has an inkling of its power), Matt is launched back to 1907 Carlisle, Pennsylvania. Trapped in history, he’s mistaken for a light-skinned Native American and assigned to an Indian school for assimilation. He joins the football team, aided by Iris’s great-great grandfather, Alfred Jongler, who, like Iris, also plays the cor anglais. Matt learns the history of football, gets a crash course in humility, and meets a girl who demands respect. Meanwhile, Octavia Jongler-Jinks, mother of Iris and her twin brother, Arky, disappeared mysteriously a year earlier. Unbenownst to others in her family, Iris has learned that the magical horn might be responsible. With several interesting characters and subplots, the novel spends considerable time (perhaps too much) exploring Matt’s predicament and football history and strategy, while leaving readers wondering how the twins are coping with their friend’s disappearance. The playfully sexist tone and emphasis on football may deter some female readers. But author Brian Meehl’s easily accessible writing style contains plenty of winning humor (describing a room filled with war and “time and space” artifacts, the author writes: “the only thing the clashing collections… had in common was a layer of dust”). That, along with light-hearted sexual innuendo (“where Jim’s favorite outing is good for an inning”) makes for an amusing read. 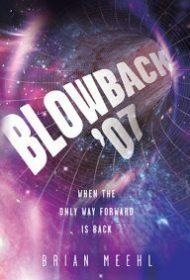 Overall, Meehl has delivered an entertaining YA story, one that will hold particular appeal for teenaged males. Also available in hardcover and as an e-book.